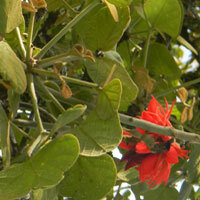 Small or medium sized tree with clumps of bright red tubular flowers, coral-colored beans and trifoliate leaves. Short curved thorns. 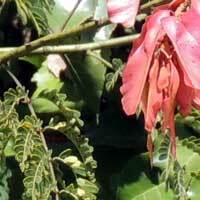 Large shrub or small tree. Twigs and branches with paired thorns. Twigs, leaves and seeds hirsute. 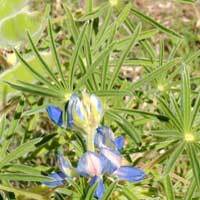 Grows in wet soil. Pith Tree. 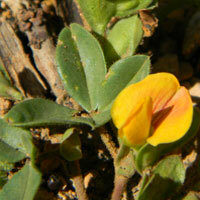 I have not identified this prostrate bean with bright yellow-orange flowers. 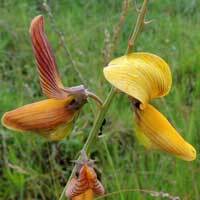 Found at 2000 m in agricultural area of the Rift Valley. 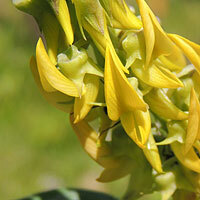 Woody plant of wet soil with yellow flowers and long, slender bean pods. Compound leaves with many small leaflets. Pinnately compound leaves on a solid tree of woodlands. Flowers in purple clusters. Over-harvested for wood. Tree with hard wood and a few spines. Small white flowers in clusters with vague pea-flower shape. 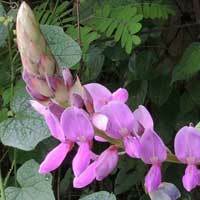 Vine-like plant with large tri-foliate leaves, spikes of pink-purple flowers, and seeds that adhere to clothing. 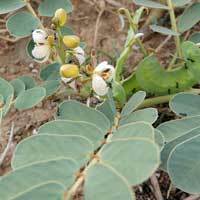 Vine-like plant that scrambles over other plants with large tri-foliate leaves and small red pea flowers. 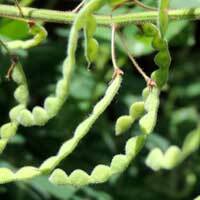 The bean pods are segmented and are covered with sticky, hooked hairs. 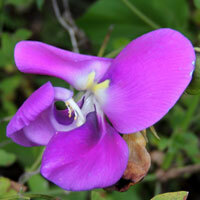 Small, bright pink pea-flowers on intricately branched herb. 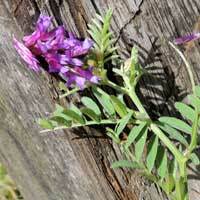 Small, bright pink pea-flowers on intricately branched herb. 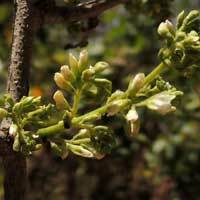 Bean pods break into sticky one-seed segments. 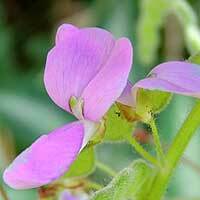 Compact spherical heads of small pea flowers on green, leafy forb. The leaves are conspicuously three-parted. 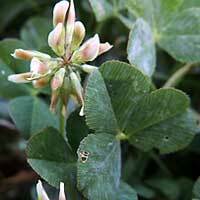 Herbaceous clover-like plant with trifoliate leaves and blue flowers. Montane areas. Vine with trifoliate leaves and large two-lipped pink or purple flower. 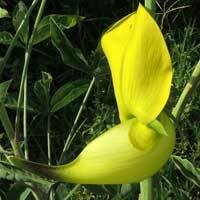 The flowers appear twisted and cupped on one side. 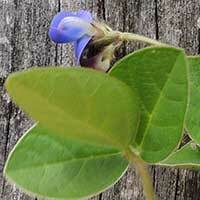 Herbaceous, vine bean with trifoliate (3 leaflets) leaves and sky blue flowers. Pink flowers on mostly herbaceous, viny plant. 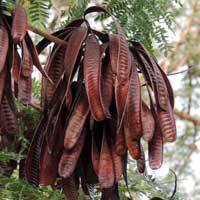 Leaf rachis extends beyond last leaflet pair and acts as a climbing tendril. 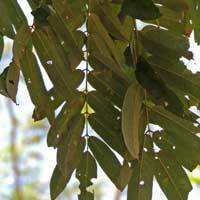 Compound leaves are characteristic - leaflet arranged in a circular pattern. 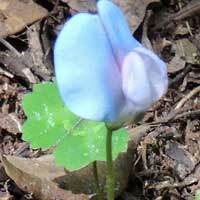 Herbaceous plant with blue pea flowers and turgid pods. 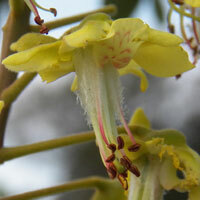 Bright yellow, closely packed flowers on an erect spike. Leaves with three leaflets. 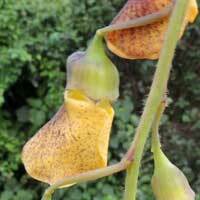 Fruit a turgid pod with beans inside that break loose and rattle when the pod is shaken. 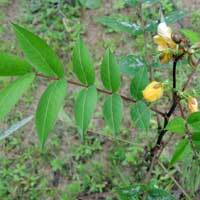 Herbaceous plant with very narrow trifoliate leaflets. Inflated bean pods. Leaflets are in sets of three, but are broadly elliptical. Shrubby plant close to 2 m tall. The keel petal is very long and sickle-shaped. Inflated bean pods. 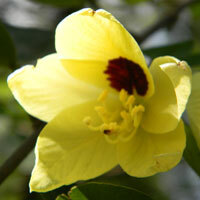 Bright yellow, bilaterally symmetrical flowers have a maroon center. Woody shrub or small tree. Two-lobed leaves are distinctive. 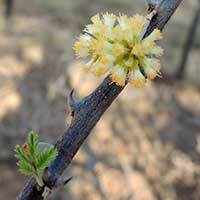 Wickedly thorny shrubs prized as a barrier fence but also loathed as an invasive weed. Leaves twice compound. 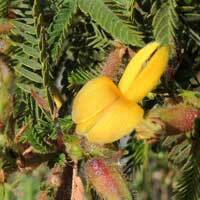 Robust, largely herbaceous plant with spikes of bright yellow and brown pea flowers. Common at roadsides at mid elevations. 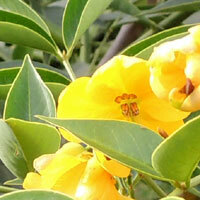 Robust shrub or even reach small tree size. 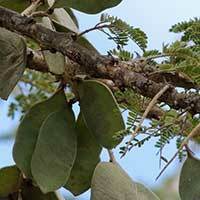 Pinnate leaves are shiny green about 5 to 7 leaflets. 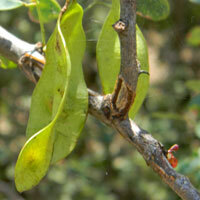 Terrate pods turn black at maturity. Bright yellow flowers on shrubby weed of pastures. Long slender bean pods. Compound leaves. 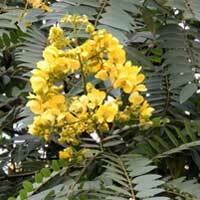 Very large sprays of yellow flowers on small tree with compound leaves. Frequent ornamental around Nairobi. 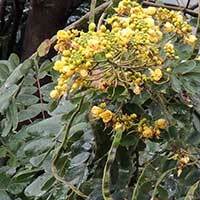 Medium-sized tree with large clusters of yellow flowers is originally from s.e. Asia. Planted for fodder and shade. No thorns. 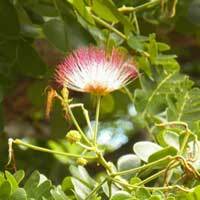 Medium-sixed tree with twice-compound leaves and 5-petaled flowers with long, showy stamens. Seeds in flat, woody pods. 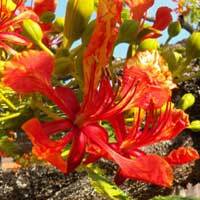 Spectacular landscape tree when in flower. Double pinnate leaves. 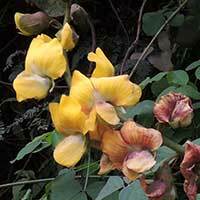 Long woody bean pods. Non-native. 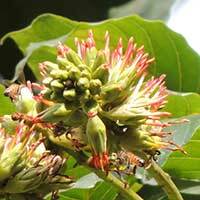 Pinnate compound leaves, woody bean pods and flowers with short red petals. 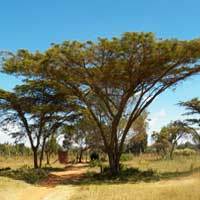 Non-native tree planted in Nairobi. Long, slender branches of this thorny plant grow up and over other plants. 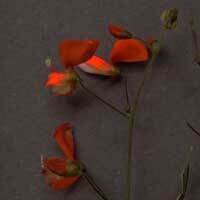 Bright red-pink seeds look like flowers or else maple seeds. Groups of low woody stems from a below-ground crown. Flowers whitish. Pods flat, sickle-shaped. Flowers in puff-ball clusters, white and pink in color. Leaves shiny dark green; twice compound with 2 to 4 pinnae. No thorns. Small non-native tree planted for soil improvelment and forage schemes. 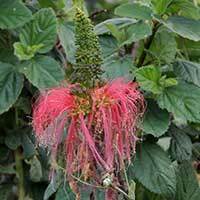 Long, pendulous, pink stamens from the flowers. 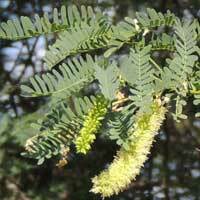 Tall acacia with twice-compound leaves with 2 to 3 dozen leaflets. Small white to cream flowers in spikate heads. Mid to higher elevations. 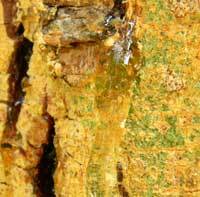 An elegant flat-topped tree with reddish bark on older trees and peeling on younger trees. Tall savanna trees with distinctive yellow, green and brown bark. Leaves twice-compound. White thorns in pairs. Lots of resin oozes from injuries. 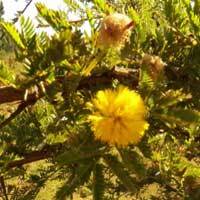 Thorny acacia shrub or small tree common on overgrazed land. Pods are thin, flat and curved. Thorns gray or sparse. The very sharp thorns are paired and sharply hooked. Small tree or large shrub. Pods thin. Leaves twice compound. 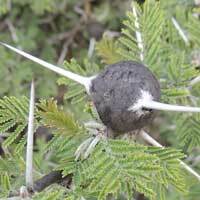 Pairs of stout, hooked thorns. 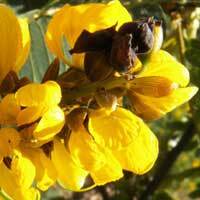 Leaves twice pinnate with 6 to 8 sets of 18 leaflets. Pods thin and papery. Medium size tree. Paired thorns on a greatly enlarged base that becomes very dark-colored and then inhabited by ants. Spherical clusters of small white flowers. Relatively few, large leaflets in double-compound leaves. Beans in flat, twisted pods. Short hooked spines. Usu. a shrub or rarely a small tree. 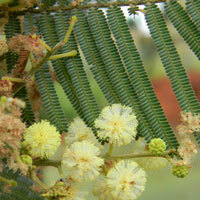 Fast growing tree native to Australia. Smooth dark bark. Small pale yellow to white flowers in ball. Seeds in bean pods. 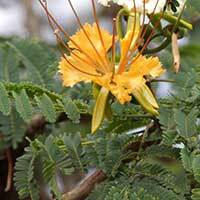 With good intentions this tree from tropical America was introduced, but now it's an invasive menace. Thornless tree with small white flowers in spherical heads. Leaves are twice compound. 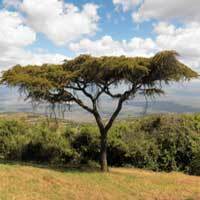 By no means am I an expert on the Natural History of Kenya because I am a novice to exploring this part of the World. By creating a page for the species as I learn them I am teaching myself, sharing with others and happy to receive feedback from web site visitors.